Here is some surprising yet worthwhile advice you might be hearing for the first time: Brushing after a meal can be incredibly bad for your teeth if you do it after eating certain foods. Enamel is an extremely hard mineral on the exterior of each of your teeth. It’s actually the hardest substance in the human body: It’s even stronger than your bones! Its only weakness is that acids in the food we eat can easily destroy enamel. Healthy teeth thrive in an environment that has the proper pH balance. That ensures your mouth doesn’t start the process of demineralization. That’s what happens when alkaline turns into acid, which attacks and softens the enamel on the surface of your teeth. Pores and fissures form, and that’s when the harmful bacteria go to work. Our mouth’s pH level fluctuates depending on what we eat throughout the day. Examples of the most common highly acidic foods include citrus fruits, soda, and sugary foods. Highly acidic foods tip the balance of pH in your mouth from a healthy alkaline to a dangerous acid. Can brushing your teeth immediately after a meal lead to even more damage? The answer is yes! Eating highly acidic foods causes your teeth to be more susceptible. If you brush your teeth when they have been weakened by acids, even more destruction can happen to your enamel. 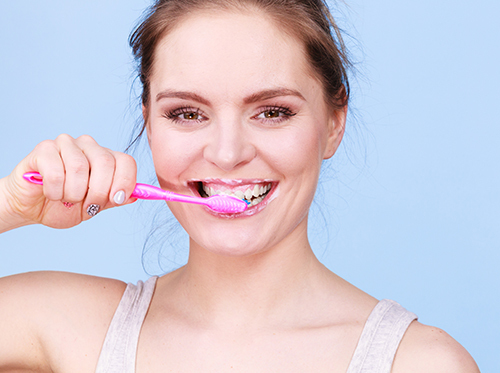 Your toothbrush’s bristles will actually wear away some of your enamel. So it’s healthier to wait at least an hour after eating or snacking to brush. These practices help produce saliva, which in turn restores a healthy pH level in your mouth and coats the teeth with minerals they need. Once you’ve allowed time for your mouth to be restored to a healthy pH level, you may brush your teeth as you normally would. Keep in mind that acidic foods can weaken the enamel on your teeth and take the right measures to prevent spiking pH levels. Most important, don’t forget to wait to brush at least one hour after you eat! Still have questions? Call our Cincinnati, OH office and schedule an appointment with Dr. Walter Gay Jr..